The system is working on Echolink. The Shoreline radios are shut off ! All the West Side radios are now located at Bothell Health Care. "BHC"
442.550 Repeater (west side only), 145.570 Simplex & 440 link radio. Will be moving the ant to a tree soon and will gain about 80' in height. Should be better coverage. Just need one more amateur time unit. 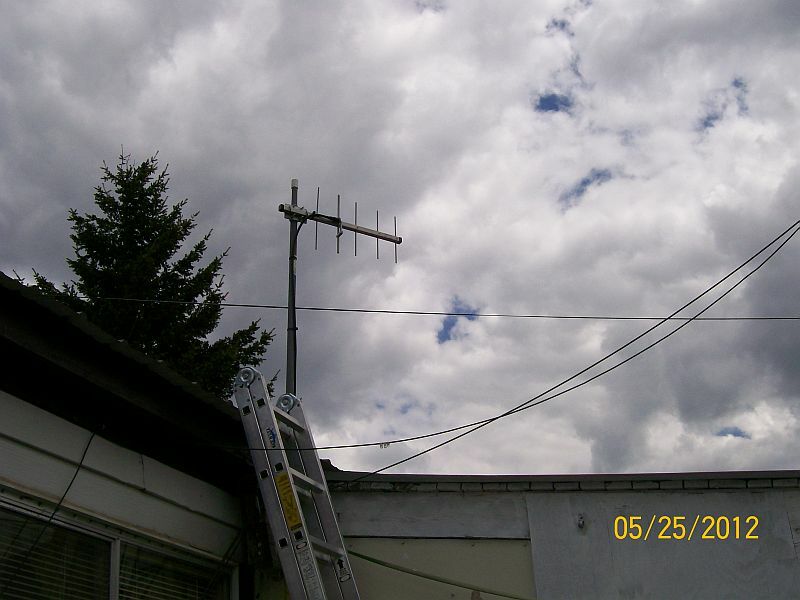 6/6/2012 Put up new beam ant today and turned the repeater back on. Set levels by ear. Seems like things are usable. 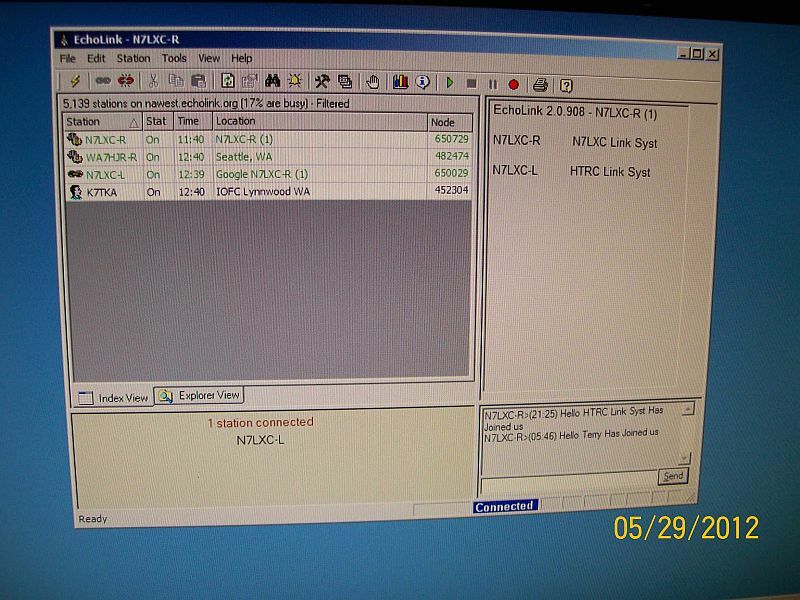 Anyone with a validated call sign and Echolink installed on their computer can get into the link system from anywhere in the world. 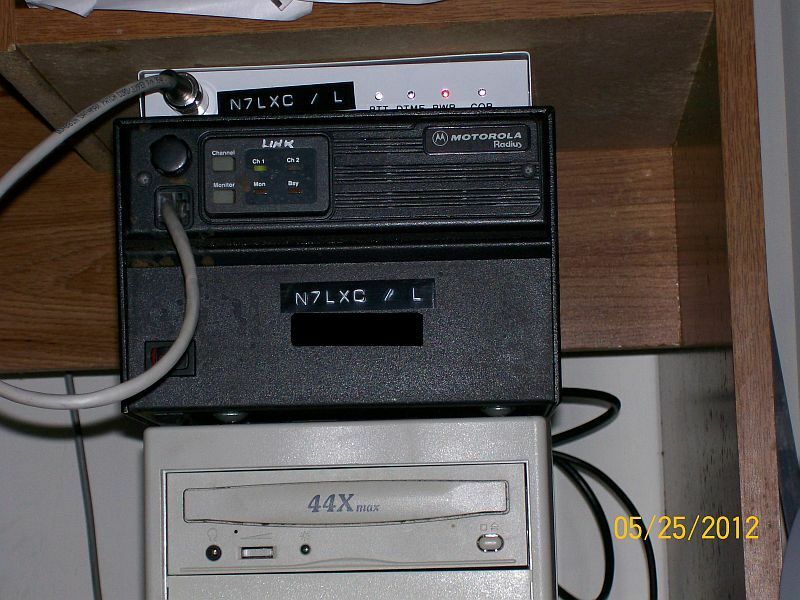 Remember to connect to N7LXC-R with Echolink. N7LXC-L is closed to internet user connections. 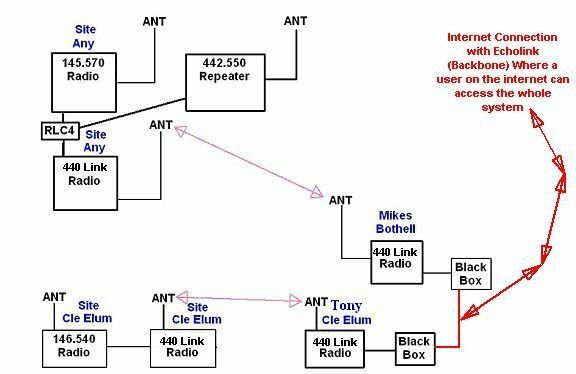 The N7LXC link system is announcing its link to the Amateur Radio Software Echolink. The port into our system for echolink is N7LXC-R and that port is now validated and running 24/7. Anyone entering the system from echolink will be tied to the radios on both sides of the mountains. KD7RKP “Kristen” down near Graham, WA. could enter the system on echolink to talk to her Dad KC7ZQE “Tom” at Boulder Creek. 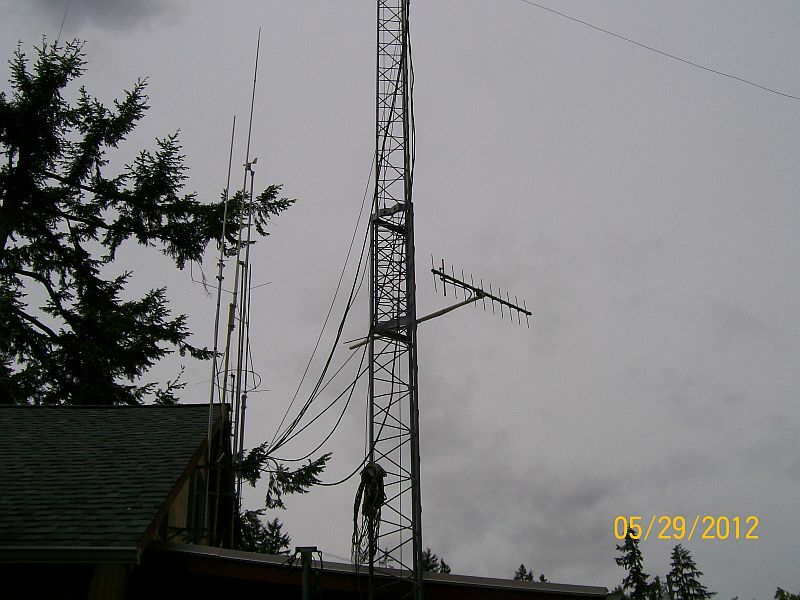 After connecting to N7LXC-R with echolink, her voice will be transmitted out on the radios at both Bothell & Cle Elum. 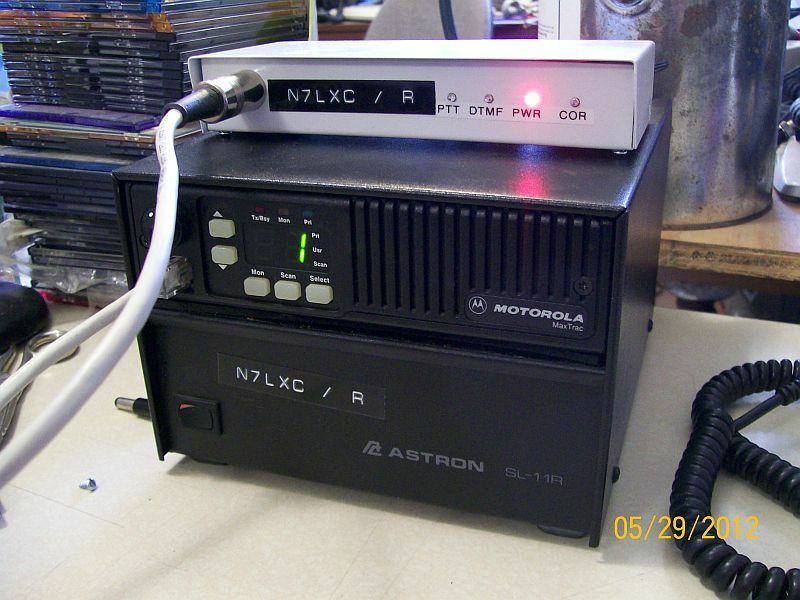 Another example: KC7RZ "John" in East Wenatchee could connect to N7LXC-R with echolink and talk to his friends on the west side. All the while the fellows on the east side would be hearing everything also. This will be a big improvement to the system for many users. It will also clear up some problems we have been having with the 440 path from Shoreline to Cle Elum. You will have to send them a copy of your Ham license to be validated on echolink before you can use it. The red arrows are where Echolink users enter the system. The Interface between the radio & computer are made by Fox Delta model "Fox Echo K7"
They have the AGC boards in them. Sorry for any inconvenience to users of the system. I just had time to work on it then. Friday 5/25/12 Mike drove to Cle Elum and Jack & Mike set up the Echolink system for the East side. (see pictures below) Everything went well and it worked fine on Echolink to the east side from the west end. Saturday 5/26/12 Mike turned off the link radios at Shoreline and started to fire up the echolink for the west side. We knew we had a bad port 1 on the controller and after some time messing around with port 3 for echolink, (which we had not been using until now) Mike figured out that port 3 also had a problem. 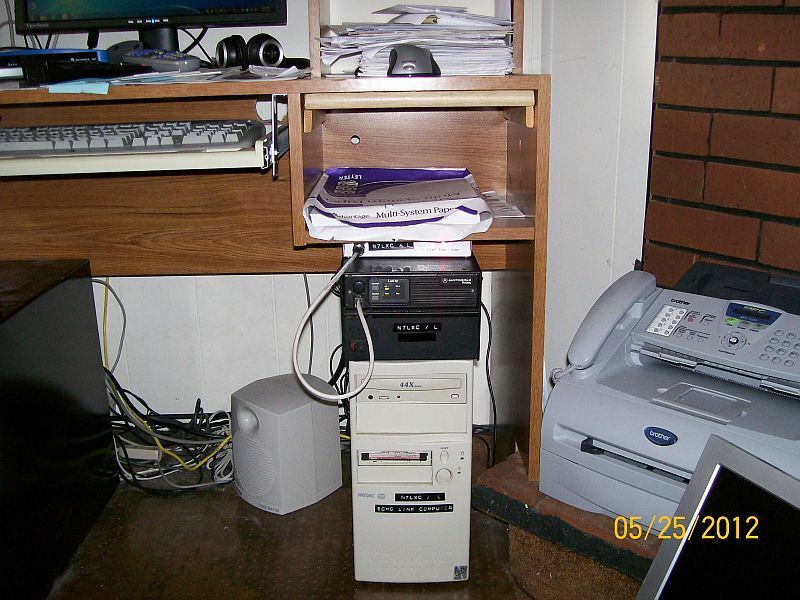 W7HNH offered to loan us his RLC-4 until we got ours fixed. So Sunday 5/27/12 Mike & Patti drove back over to Cle Elum to get the borrowed controller. Got it home and found it had newer software installed in it. The commands changed considerably in the new software and I had to rewrite the programming for our system. Mike finished the file up Monday morning and loaded it into the controller. Went up to the site and installed the controller. Now the audio levels need to be set in the new controller. Everything is up and running but the audio levels need to be set better. This morning Tuesday 5/29/12 I went back up to the site and installed a 35 amp power supply to just run the repeater. With 3 radios on the existing 50 amp power supply and drawing right at 50 amps we were asking to much of the one supply. That is why the 35 amp was installed. Anyhow... The connection to the east side is good to go if you are using echolink. It comes out on the radios over there fine. As soon as we get the levels set at the west side, everything should be good to go. Well here it is Wed 5/30/2012 and I started testing things out some more. I found that the biggest problem we had was the link beam Ant at the BHC site. It just was plain bad. I turned off the repeater and hooked the link radio to the dual band ant that the repeater was on. Bingo... everything started working. So... I just need to replace the link ant with another beam and switch the repeater back to the dual band ant. Bob said he would help set the levels in the controller neat week.